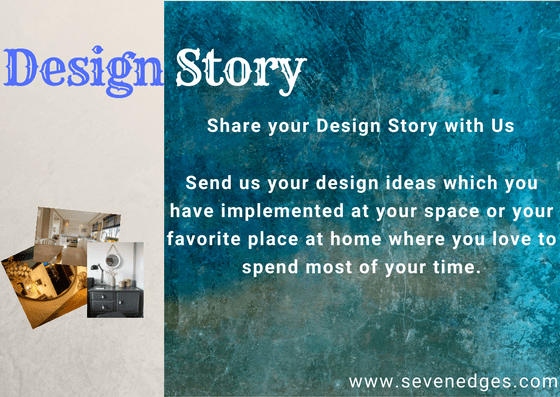 This is a different section of my blog where you can feature your design ideas which you have implemented at your house or a favorite place at your home where you love to spend most of your time. It can be any smart interior ideas or DIY you have done at your home to make your work more easy or to personalize your space. Send it to us and showcase your skill. Click a clear, beautiful photograph of the space/unit(Crockery, Bookshelf, Organizer, Dresser, Makeup mirror) or the entire room. Please remember to have the subject as “Design Story” which will help me to identify soon. 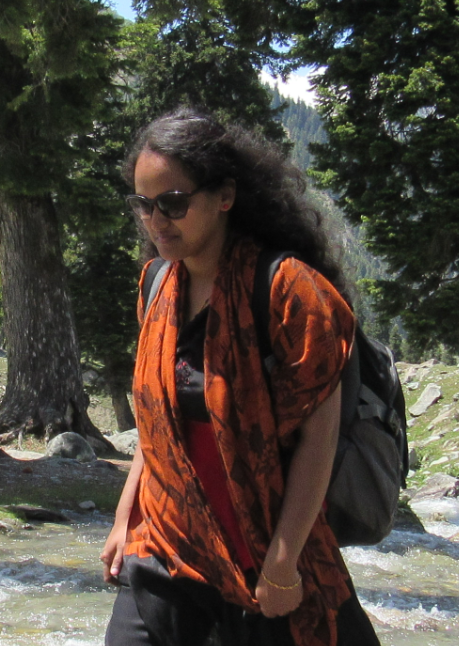 For sending your queries, you can send a mail to sharikasree7 at gmail dot com. From each 50 Design stories, we pick 2 beautiful and smart ideas and send you an $25 Amazon E-gift card. Showcase your Design Ideas here. Let me start with my story!! 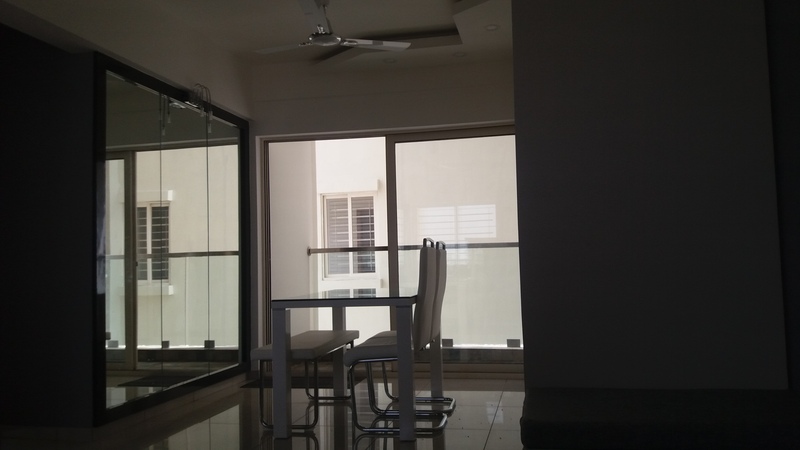 Recently we shifted to our new apartment which we had booked a long back means before pre-launch, I would say. Those days, with the budget our mind we took a small house but when it was ready to move after few years, we felt it was quite small for us. By the time we had one more naughty one came to our family. Apart from the living and dining he hardly had place to move in other rooms. On the other hand my elder daughter was looking for lot of storage space where she had to keep her stuffs(mainly her craft items). Both of the bedrooms had wide windows which almost cover a wall. So we wished to have window seating there. And we decided to have that in our kids room and to make a storage for her below the seating. 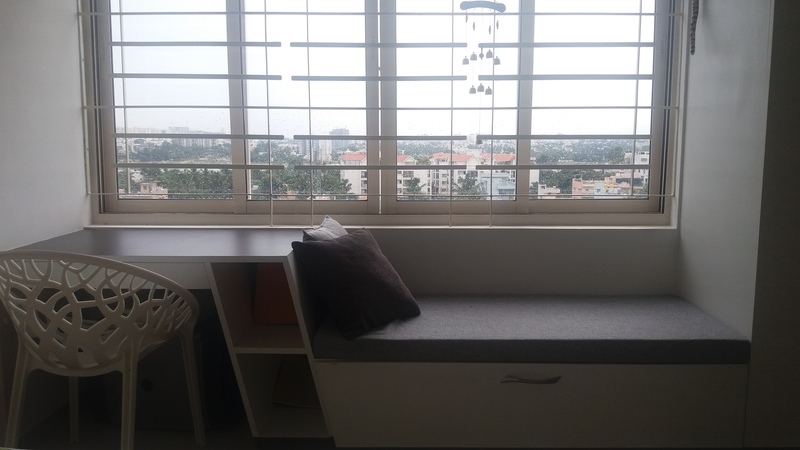 We designed her room in such a way that her study table, the window seat and the cupboard comes on one side, everything attached. This gives us some space to move around the room after having the cot on the other side. It came out well as planned and we all love the window seat for a evening chit chat and with our baby climbing the window easily from the seat. Same way to have an extra space at the dining area, we placed a full length mirror. That way it doesn’t look so congested and reflects the balcony which is on the other end. We had a White Grey theme for our house, which we maintained for all the items at home too. We bought an Alaska White laminate Dining Table which reflects to the mirror on the wall. 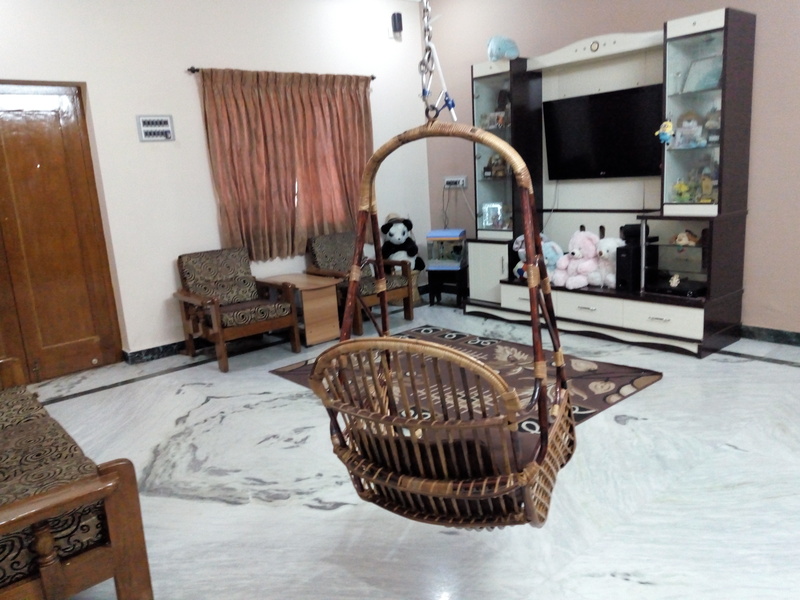 These are the two favorite places of our house which we designed our self according to our preference and we love to spend time here most of the time and have fun. This is my favorite place at my home, and this my design story. What is yours? My living space is a pure mix of cream and brown. Cream is his favorite and mine is chocolatey brown. Our best comfort zone which reminds all the happy moments with our loved ones. My naughty one has ample space to run around, he even plays cricket and football with his dad, run track for his electric bike and lots more on the play list. 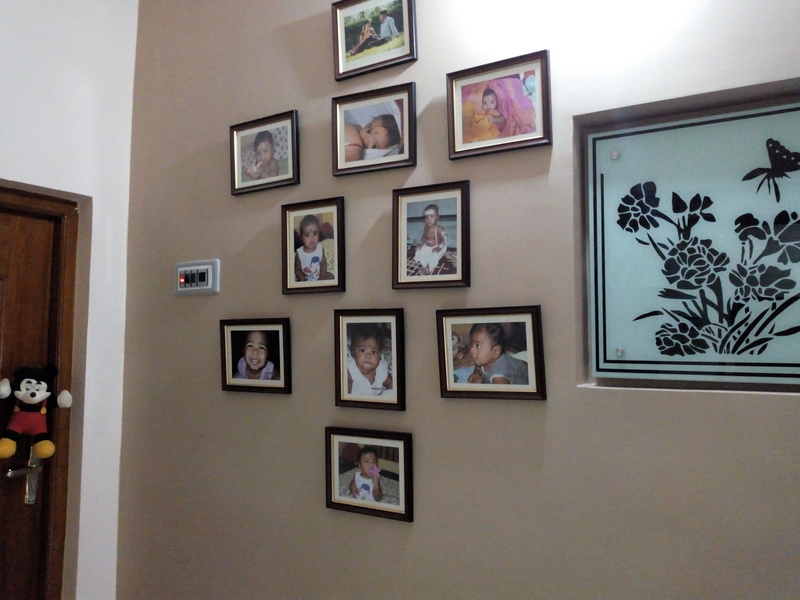 The room extends to a wall opening which showcases a photo wall of my lil juniors’ pics. That’s my special wall which I highlight with bright lighting in the evenings. Next on the list is the creamy, browny wall unit that holds all my best toy collections. This wall unit had a painted glass in the middle which we removed and fixed the TV. Guess where I have placed the glass painting? Its fixed to the photo wall. Every Friday is a sure movie night for us and its really amazing in our mini living room theatre. This is my ideal space at home where I start my day with a cup of coffee and also the end of a long day to relax with family. I wanted something that was super glam and modern, so I decorate my living room with glam and bold look. Our living room is the epicenter of ours home. It’s where the family comes together at the end of the day to spend time together. The dining table stands at the center of it all, when the family gathers to share food and laughter. The floor has a large surface area which can help reflect and maximize natural light in our living room. Our living room has a vertical dimension as well as a horizontal one. We had use of neutral colors on walls, floor, ceiling and furniture upholstery.